Cod Fish is sometimes referred to as the Chicken of the Sea, because of it's white flaky meat and mild taste. There is actually 2 species of Cod, Atlantic and Pacific. But very rarely with you see them marketed by their name. 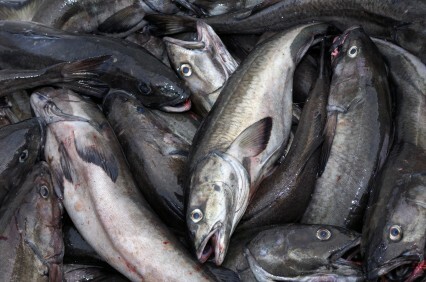 The names you will see most common with cod is "Scrod Cod", Icelandic Cod and the Lingcod which isn't even a Cod. Scrod Cod is a term used for smaller cod under 2 1/2 pounds. Icelandic cod is for fish caught in Icelandic waters. The cod belongs in the Gadidae family which also includes haddock, pollock, hake and hoki. Atlantic cod fillets have a lean meat, with a mild flavor and large white flakes when cooked. The Pacific cod is lean and flaky with a mild taste, but is not as firm as Atlantic cod because of a higher moisture content in them. Because of the lean meat that cod has, it is best to cook it with moist heat. Probably one of the most common ways of cooking cod is either breaded or battered and fried. But with such a mild flavor, cod is an excellent fish for such seasonings as dill, basil, tarragon and ginger.